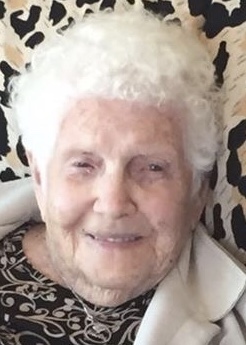 Dorothy Rose “Ditty” Harrington, 97 of Johannesburg and Atlanta, passed away at home on Thursday, March 21, 2019. Born on November 9, 1921 in Detroit, Dorothy was the daughter of Charles and Rose (Wolff) Rumbold. She was a graduate of Lincoln High School in Ferndale, Michigan. On November 19, 1944 Dorothy married Herbert Lee Harrington in Ferndale, MI. Dorothy and her family were longtime residents of the Heatherton Community. She was active in the formation of the Heatherton Church and a longtime member there. An avid writer, Dorothy made daily entries in her journal. She chronicled the building of their home, the church and the activities of daily life in Heatherton. In 2011 she was honored as the grand marshall of the Johannesburg Fourth of July Parade. Dorothy was a bird lover and she especially enjoyed her mourning doves. She was a strong supporter of the Elk Country Animal Shelter and dog lover. She had many dogs over the years, naming each of them “Rusty”. She will be remembered for her strong commitment to helping others with their financial needs and she was especially committed to the needs of young people and animals. She was a good woman who will be dearly missed. A memorial gathering and interment at Meridian Line Cemetery will take place this summer. Those who wish are asked to consider memorial contributions to Hospice of Michigan or the Elk Country Animal Shelter in Atlanta, MI.